Our customers depend on your daily work. As an employee in Systematic, you know the importance of our solutions being simple and reliable. What you do will make a difference â&#x20AC;&#x201C; sometimes even between life and death for those who depend on the end result. Our customers work in complex environments and make difficult decisions every day. They depend on our IT solutions to provide them with a reliable overview of the information available and to make it easier for them to make mission-critical decisions. Like us, were you born to make complicated things simple? Then join our mission and simplify critical decision-making for more than 1.000.000 users around the world. You need to be able to understand each individual customerâ&#x20AC;&#x2122;s business as well as being able to communicate with them in a language they understand. You see, thatâ&#x20AC;&#x2122;s one of the basics for working in Systematic, because we believe the best ideas are developed in collaboration with our customers. We provide software systems that make a big difference for customers throughout the world by giving them the overview and decision-making aids necessary for making critical decisions. We specialise in solutions for customers within defence, healthcare, finance, intelligence, national security, government agencies and large corporations. At Systematic we are always looking for new ways and tecnologies to help our customers in order for them to make the right decisions in critical decisions. For instance we work with big data and machine learning which let us identifying patterns and forecasting developments which creates valuable knowledge for our customers. YOU AREN’T A SLAVE TO PROCESS We depend 100% on your professional skills. As an employee in Systematic, you value processes, but you also know that it’s you and your colleagues who make the difference – the processes are only there to support you. We care about developing and defining processes whose single goal is to provide value to our customers. Our processes challenge us and make us ask questions, but they don’t decide which techniques to use in order to succeed – for that, we depend 100% on your professional skills. Our focus on continuous improvements and process maturity means a minimum of unforeseen surprises while you’re working, resulting in more room for innovative thinking and the opportunity to work on high-quality software systems. Above all, this unique approach enables us to create reliable, high-quality solutions for our customers and to deliver on time and at the agreed price. You can be whoever you want to be in Systematic. Well, almost. We expect that you have career goals and that you care about your professional development. In return, we offer you opportunities to develop your career within our company – whether it’s new responsibilities or new competencies. We believe it’s better to train people and risk that they leave, than do nothing and they stay. That’s why we do our best to give you the opportunity to develop your skills and widen your horizons. 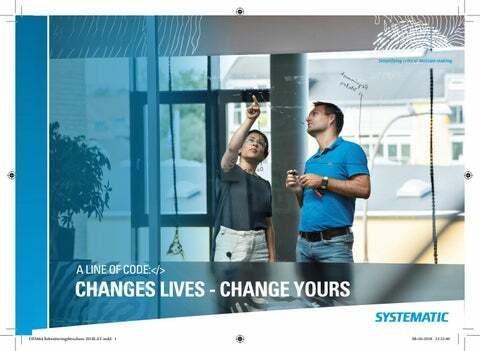 Your journey with Systematic could also start like this: INTERNSHIPS: Interns participate in our software development projects and serve as ordinary members in our project teams. This means you’ll be responsible for sections of the development work on an equal footing with all of the other team members. FINAL PROJECTS: If you would like to put your theory to test in the real world, you might want to consider collaborating with us when you do your final project. After 5 years of employment, I have worked with a great variety of things within Systematic. I started as a Systems Engineer at the main office in Aarhus working with software development in Defence Products. Recently I have been stationed in New Zealand with my family for a period of 14 months as a Senior Solution Engineer - working in close corporation with our local customer on improving processes and providing technical support. It is really motivating to work in a company that allows these opportunities to combine both work, life and seeing the world. My journey at Systematic started with an internship, continued with a student position and got me a full time position as a Systems Engineer upon graduating. Even though I come from a different culture and do not speak Danish, I have felt welcomed and accepted from day one. Since then, I have worked closely with my team in solving challenging problems. I feel lucky to have such knowledgeable co-workers to learn from. Moreover, I am encouraged to develop my skills, both professionally and personally, and am excited as well as curious to see where this journey will take me. I still feel that Iâ&#x20AC;&#x2122;m evolving and learning something new every day. I have chosen to stick with my programmer identity, even after so many years in the business. If one day I should want to change course and take on a different role â&#x20AC;&#x201C; project management, testing, architecture â&#x20AC;&#x201C; I know there will be good opportunities for this too. Meanwhile i am enjoying a part-time job as facilitator and teacher of Scrum and other agile methods, both inside and outside the company. Whether you are newly qualified or already have work experience, we will do everything to make you feel welcome.